What type of food should I feed my kitten and/or cat? Until your kitten is a year old, he or she should be eating a kitten formula food. Other life-stage food formulas do not provide the proper balance of calories and nutrients needed for a growing cat. As a general rule, you should switch to an adult formula diet around your kitten’s first birthday. Once your cat is seven years old, a senior formula cat food is recommended. Pregnant and nursing cats should be fed kitten formula food. What brand of food should I buy? Because your cat’s food must provide for all of his or her nutritional needs and energy requirements, it is important to buy the highest quality food that you can afford to feed him or her. Clermont Animal Hospital recommends BLUE Wilderness, Iams, Hill’s Science Diet and Purina products, but there are many other quality foods on the market. When choosing a brand of food, be sure to look for the AAFCO (American Association of Feed Control Officials) approval label on the bag to insure that the food meets all nutritional standards. If you would like further information on choosing a diet, our staff will be happy to help you. Is it okay to change brands of foods? It is important to choose one brand and type of food rather than randomly buying whatever is on sale or most convenient. This is because changing foods can upset your cat’s stomach and intestines. Any time you decide to introduce a new food to your cat, be sure to reserve some of the old food for a transition period. Mix the new food in gradually, increasing the amount of new food and decreasing the amount of old food each day. 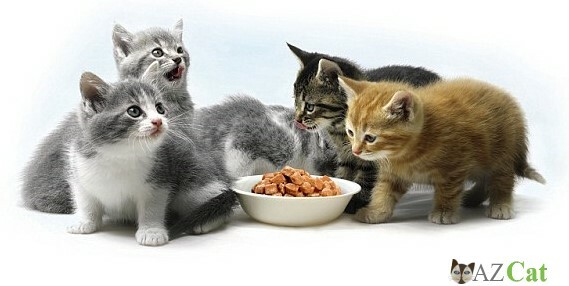 Most cats will tolerate new foods well with a four to five day transition period. Watch your cat carefully for any signs of intolerance during the transition (decreased appetite, cat diarrhea, etc.). If you notice these signs, slow down the rate at which you are introducing the new food and lengthen the transition period to 7 – 14 days. Do I need to give my kitten vitamins? Most commercial kitten foods provide all of the vitamins and minerals your cat needs; however, a vitamin supplement is a good way to ensure that your growing cat meets all of his or her nutritional requirements. This is particularly important if your cat is a finicky eater, during periods of illness, or if more than 10 percent of your cat’s diet is something other than commercial kitten food. Clermont Animal Hospital provides several types of vitamins here for your convenience. These are very tasty and make good treats for your kitten. The Felovite supplement is also good for preventing and treating low blood sugar in young kittens. Can I feed my cat “people food” and treats? Even using human food for treats is not a good idea. Once a kitten learns to expect handouts, begging and occasionally food snatching becomes a problem. Also, human foods are often high calorie treats, which can contribute to obesity. Because 50 percent of cats are lactose intolerant and will develop diarrhea if fed certain dairy products, it is a good idea to watch for this reaction in your cat and avoid dairy products if it occurs. Never feed ham, pork or other fatty meats to your cat—these can lead to pancreatitis. Many rich foods lead to diarrhea, vomiting, or upset stomach. Your cat’s diet should be at least 90 percent kitten/cat food. All human food, cat treats, and other supplements should make up 10 percent or less of the total calorie intake. If this is not the case, your cat may not be meeting all of his or her nutritional requirements. Feed human food in small portions. A bite-sized portion for you would be an entire meal for a small kitten. Keep your cat’s body size in mind when you’re doling out the treats. Never feed your cat directly from your plate. This encourages mealtime begging. Introduce only one new food item at a time and watch for any sign of upset stomach following this. If a certain food causes a bad affect, avoid this food item in the future. Treats produced and marketed specifically for cats are preferable to human food. Larger treats can be broken into bite-sized pieces for training and extra enjoyment. You will find that your cat will be more content with smaller treats given more frequently than with larger treats given less often. If you’re cat is on a special diet, reserving a few kibbles to give as treats is often enough to satisfy your cat’s treat cravings. Keeping your cat in the ideal weight range is probably the best thing you can do for his or her health. Overweight cats are much more likely than trim cats to develop a variety of problems including arthritis/joint problems and diabetes. While these are usually problems of older animals, good dietary habits must start in kittens. The most important aspect of weight control is the amount of food you feed your cat. If at least 90 percent of your cat’s caloric intake comes from kitten/cat food, the feeding guidelines on the food bag are a good starting point in determining how much to feed your cat. Keep in mind that these guidelines are tailored to the needs of the average healthy cat. Once your kitten is spayed or neutered, his or her caloric requirements will probably decrease by 25 – 35 percent. It is also important to realize that if your cat is very athletic and energetic or a total couch potato, you may need to adjust the amount of food you provide. Most kittens under 4 months old should be fed at least three times a day. Kittens 4 – 12 months old should be fed at least twice a day. Adult cats can be fed one to two times, a day depending on owner preference. When eliminating a feeding time decrease the amount of food fed at that meal gradually over a five to seven day period to help ease the transition. Free-choice feeding (having food available all the time) is an alternative, as long as you are careful not to put out more food in a day than your cat should be eating. In addition to controlling the amount of cat food fed, limiting calorie intake from treats and encouraging an adequate exercise program are also important in maintaining ideal weight and body condition. Weight varies greatly among breeds and with body structure. Body condition is a much more accurate way to determine if your cat is eating the right amount. Cats who are in ideal body condition have a clearly defined, tucked waist. If you run your hands over the rib cage of these cats, you should be able to easily count every rib, but you should not be able to see the ribs looking at the cat. If your cat is starting to lose his or her waist and developing a fat pad making it more difficult to feel the ribs, then it is time to decrease his or her caloric intake. This can be done by decreasing the amount fed or switching to a lower calorie diet (most pet food brands have a light or weight control formula). If you can ever see your cat’s ribs, then you are not meeting your cat’s energy needs and should increase the amount you are feeding your cat. Monitor your cat’s body condition throughout his or her life, and adjust the number of calories you are feeding as is necessary to maintain ideal body condition. © Clermont Animal Hosptail, Inc.